Collecta at St. Agatha in Monasterio. Station at St. Vitalis. The meeting place today is in the deaconry of St. Agatha “of the Goths” in the Suburra, which was restored to Catholic worship by St. Gregory the Great. From there the procession went to the neighboring Church of Vestian, dedicated under Innocent I (402-17) to the martyr Vitalis. The martyrology of Ado confused this Vitalis with the saint of the same name at Ravenna. In the Mass, the choice of the lesson of Joseph let down by his brothers into an empty well, and the Gospel of the wicked husbandmen who stoned their master’s son, was suggested by the Acta of St. Vitalis, which tell us how the martyr was first buried up to the waist in a pit and then stoned to death. The Church, as though she feared that the very splendour of her liturgy might lead simple folk into thinking that Christianity consisted merely in holding functions and receiving the sacraments, insists continually in her Lenten formulas that we should by our good works, give reality to what is so sublimely expressed in the liturgy. Saint Patrick is the patron saint of Ireland. He was a Christian missionary given credited with converting Ireland to Christianity in the AD 400s. So many legends surround his life that the truth is not easily found. St Patrick was not actually Irish. His exact birthplace and date is not known. However it is believed he was born around 375AD in Scotland. His parents were Calpurnius and Conchessa, were Romans living in Britain in charge of the colonies. His real name is believed to be Maewyn Succat and he took on the name Patrick upon becoming a priest. As a teen he was kidnapped by pirates and sold into slavery in Ireland to herd and tend sheep on Slemish mountain, Co Antrim. During his six-year captivity, he became fluent in the Irish language, he turned to God in prayer. He escaped after having a dream sent from God in which he was told to leave Ireland by going to the coast where he would find a ship waiting to sail to Britain. He is believed to have met up with his parents in Wales before travelling to France where he became a priest and later a bishop. Patrick was sent another dream in which the people of Ireland were calling out to him to come and walk among them once more. He was set the task of teaching Christianity to the Irish. He travelled throughout Ireland, preaching the Gospel and converting many. He and his disciples preached and converted thousands and began building churches all over the country. Patrick preached and converted all over Ireland for 40 years. The date cited for when Ireland was converted to Christianity is 432. There is much debate over when and where he died. It is believed he died on 17 March, 460 at Saul, Downpatrick. That is why Saint Patrick’s day is celebrated on March 17th. Some people suggest he was also born on 17 March. The clans of Ireland began to bicker over who should receive the honour of having his final resting-place on their land. To avoid this sacrilegious end to his life his friends secreted away his body to bury in a secret grave. Many believe this to be in Downpatrick, County Down, where there is a permanent memorial. But I in justice shall behold Your face; I shall be content when Your glory shall appear. Ps 16:1 Hear, O Lord, a just suit; attend to my outcry. V. Glory be to the Father, and to the Son, and to the Holy Ghost. R. As it was in the beginning, is now, and ever shall be, world without end. Amen. But I in justice shall behold Your face; I shall be content when Your glory shall appear. Grant, we beseech Thee, O almighty God, that, with the sacred fast to purify us, Thou mayest cause us to come with sincere minds to the holy things that are before us. Through Jesus Christ, thy Son our Lord, Who liveth and reigneth with thee, in the unity of the Holy Ghost, ever one God, world without end. R. Amen. O God, Who didst vouchsafe to send blessed Patrick, confessor and bishop, to preach Thy glory to the Gentiles, grant that, through his merits and intercession, we may be enabled to accomplish by thy mercy what Thou commandest us to do. Let us pray. Defend us, we beseech Thee, O Lord, from all dangers of mind and body; that through the intercession of the blessed and glorious ever Virgin Mary, Mother of God, together with blessed Joseph, Thy blessed apostles Peter and Paul, and blessed N. (Here mention the titular saint of the church), and all the saints, mercifully grant us safety and peace; that all adversities and errors being overcome, Thy Church may serve Thee in security and freedom. Through our Lord Jesus Christ, Who livest and reignest, with God the Father, in the unity of the Holy Ghost, one God For ever and ever. R. Amen. Lesson from the Book of Genesis. In those days Joseph said to his brethren: Hear my dream which I dreamed. I thought we were binding sheaves in the field: and my sheaf rose as it were, and stood, and your sheaves standing about, bowed down before my sheaf. His brethren answered: Shalt thou be our king? or shall we be subject to thy dominion? Therefore this matter of his dreams and words ministered nourishment to their envy and hatred. He dreamed also another dream, which he told to his brethren saying: I saw in a dream, as it were the sun, and the moon and eleven stars worshipping me. And when he had told this to his father, and brethren, his father rebuked him, and said: What meaneth this dream that thou hast dreamed? shall I and thy mother, and thy brethren worship thee upon the earth? His brethren therefore envied him: but his father considered the thing with himself. And when his brethren abode in Sichem, feeding their father’s flocks, Israel said to him: Thy brethren feed the sheep in Sichem: come, I will send thee to them. And when he had answered: I am ready; he said to him: Go, and see if all things be well with thy brethren, and the cattle: and bring me word again what is doing. So being sent from the vale of Hebron, he came to Sichem: and a man found him there wandering in the field, and asked what he sought. But he answered: I seek my brethren, tell me where they feed the flocks. And the man said to him: They are departed from this place: for I heard them say: Let us go down to Dothain. And Joseph went forward after his brethren, and found them in Dothain. And when they saw him afar off, before he came nigh them, they thought to kill him. And said one to another: Behold the dreamer cometh. Come, let us kill him, and cast him into some old pit; and we will say: Some evil beast hath devoured him: and then it shall appear what his dreams shall avail him: and Ruben hearing this, endeavored to deliver him out of their hands, and said: Do not take away his life, nor shed his blood: but cast him into this pit, that is in the wilderness, and keep your hands harmless: now he said this, being desirous to deliver him out of their hands and to restore him to his father. In my trouble I cried to the Lord: and He heard me. V. O Lord, deliver my soul from wicked lips, and a deceitful tongue. Lord, repay us not according to the sins we have committed, nor according to our iniquities. V. (Ps. 78: 8-9) O Lord, remember not our former iniquities: let Thy mercies speedily prevent us, for we are become exceeding poor. (Here all kneel down) Help Us, O Lord our Saviour: and for the glory of Thy name, O Lord, deliver us: and forgive us our sins for Thy name’s sake. At that time, Jesus spoke this parable to the multitude of the Jews and the chief priests: “There was a certain householder who planted a vineyard, and made a hedge round about it, and dug in it a press, and built a tower, and let it out to husbandmen, and went into a strange country. 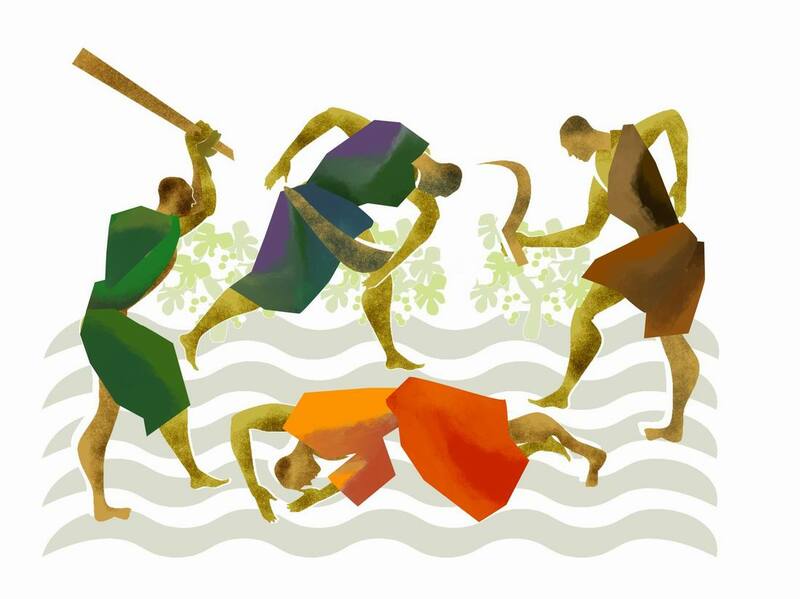 And when the time of the fruits drew nigh, he sent his servants to the husbandmen, that they might receive the fruits thereof: and the husbandmen laying hands on the servants, beat one, and killed another, and stoned another. Again he sent other servants more. than the former, and they did to them in like manner; and last of all he sent to them his son, saying, They will reverence my son. But the husbandmen seeing the son, said among themselves, This is the heir: come, let us kill him, and we shall have his inheritance; and taking him, they cast him forth out of the vineyard, and killed him. When therefore the lord of the vineyard shall come, what will he do to those husbandmen? They say to Him, He will bring those evil men to an evil end, and will let out his vineyard to other husbandmen, that shall render him the fruit in due season.” Jesus saith to them, “Have you never read in the Scriptures, The stone which the builders rejected, the same is become the head of the corner? By the Lord this hath been done, and it is wonderful in our eyes. Therefore I say to you, that the kingdom of God shall be taken from you, and shall be given to a nation yielding the fruits thereof. And whosoever shall fall on this stone shall be broken; but on whomsoever it shall fall, it shall grind him to powder.” And when the chief priests and pharisees had heard His parables, they knew that He spoke of them; and seeking to lay hands on Him, they feared the multitudes, because they held Him as a prophet. Look down, O Lord, to help me: let them be confounded and ashamed together, that seek after my soul to take it away: look down, O Lord, to help me. May this sacrifice, O Lord, both remain in us by its action and be made strong in operation. Through our Lord Jesus Christ Thy Son. Who liveth and reigneth with Thee in the unity of the Holy Ghost, one God world without end. R.Amen. May Your Saints, we beseech You, O Lord, everywhere make us joyful: so that, while we reflect upon their merits, we may enjoy their help. Graciously hear us, O God our Savior, and by the virtue of this sacrament protect us from all enemies of soul and body, bestowing on us both grace in this life and glory hereafter. Through our Lord Jesus Christ, Who livest and reignest, with God the Father, in the unity of the Holy Ghost, one God world without end. R. Amen. Thou, O Lord, wilt preserve us: and keep us from this generation for ever. Make us, we beseech Thee, O Lord, direct our course so that we who have received the pledge of eternal salvation may be able to attain it. Through our Lord Jesus Christ, Who livest and reignest, with God the Father, in the unity of the Holy Ghost, one God world without end. R. Amen. Grant, we beseech You, almighty God, that as we thank You for the favors we have received, we may, by the intercession of blessed Remigius, Your Confessor and Bishop, obtain still greater blessings. Let us pray. May the oblation of this divine sacrament cleanse and defend us, we beseech Thee, O Lord, and, through the intercession of the blessed Virgin Mary, Mother of God, with blessed Joseph, Thy blessed apostles Peter and Paul, blessed N. (here mention the titular saint of the church), and all the saints, purify us from all our sins and deliver us from all adversity. Through our Lord Jesus Christ, Who livest and reignest, with God the Father, in the unity of the Holy Ghost, one God world without end. R. Amen. Grant unto Your people, we beseech You, O Lord, health of mind and body, that, by persevering in good works, we may be worthy to be protected by Your mighty power. Through Jesus Christ, thy Son our Lord, Who liveth and reigneth with thee, in the unity of the Holy Ghost, ever one God, world without end. R. Amen.